An exhibition "Water through the eyes of children" has opened in Art Tower gallery. The event was organized as part environmental education project by NGO Arts Council Azerbaijan, the United Nations Development Program (UNDP) and the Global Environment Facility (GEF). The exhibition featured works by students of Art school,Trend Life reported. Addressing the event, Head of Arts Council Azerbaijan Dadash Mammadov said that the Kura basin is the main river basin in the South Caucasus, with the length of the main channel being 1,515 km. The Kura begins in Turkey and flows through Georgia and Azerbaijan to enter the Caspian Sea near Neftchala (Azerbaijan). Azerbaijan is attached to all international conventions on environmental protection relevant to the republic. The state has adopted a number of programs on environmental safety of the Kura River. The main technical adviser and regional coordinator of the Kura-2 project, UNDP Ukraine, Mary Metouz stressed that one of the most pressing problems of mankind is the threat to the stability of civilization and the environment, the dynamic growth of the economy,etc. For Azerbaijan, water resources in the Kura basin are an important source of drinking water. This water is also used for sanitation, hydropower, irrigated agriculture and much more. Addressing the issues of integrated water resources management and reducing transboundary degradation in the Kura River basin are among the priorities in the region's environmental security. Director of Art school Sona Guliyeva noted that children understand the true value of nature as no one else. Their vision of the world around them and the attitude to it are presented in a variety of colorful works. "Children are not indifferent to the problems of ecology. They are worried about nature, animals, which means that we have someone to care for and protect our land. It is necessary to develop environmental responsibility from the very youngest age," said the director. 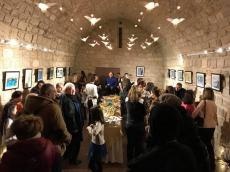 The guests of the exhibition highly appreciated the works of young artists, who were awarded with memorable diplomas.